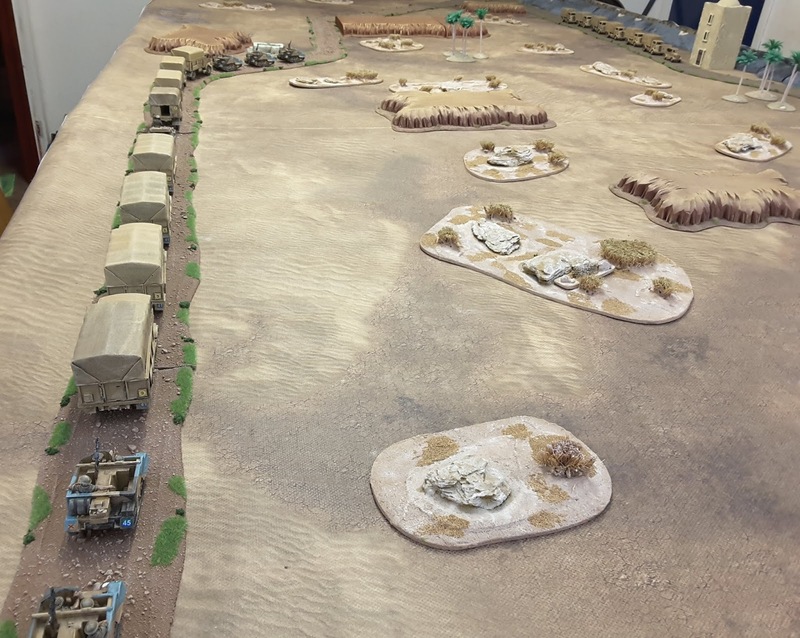 Back to the Desert for the 6th game of our ongoing Op Compass, linked scenario Campaign. In this match up the two forces are rushing to their own objectives in the middle of a Sandstorm when the weather clears and they spot each other across the Desert plain. 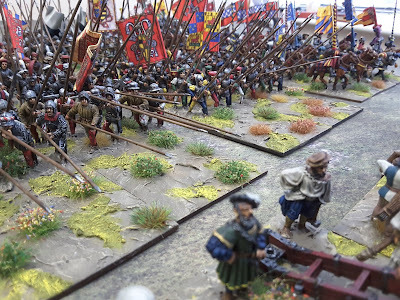 The games are based on an excellent book by Robert Avery which is available from The Toofatlardies, there is a direct link to purchase the book on the Resource Page.We use 28mm figures with this scenario taking place on an 12 x 6 table using a home brew set of rules, based on Iron Ivans Disposable Hero's. Don't laugh, at least they don't have to walk. 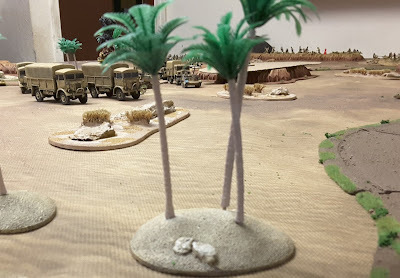 It's the 9th December 1940 and the Italian Forts at Tummar West and Nibeiwa have fallen, it's time for the British and Empire Forces to move onto the Tummar East defences. 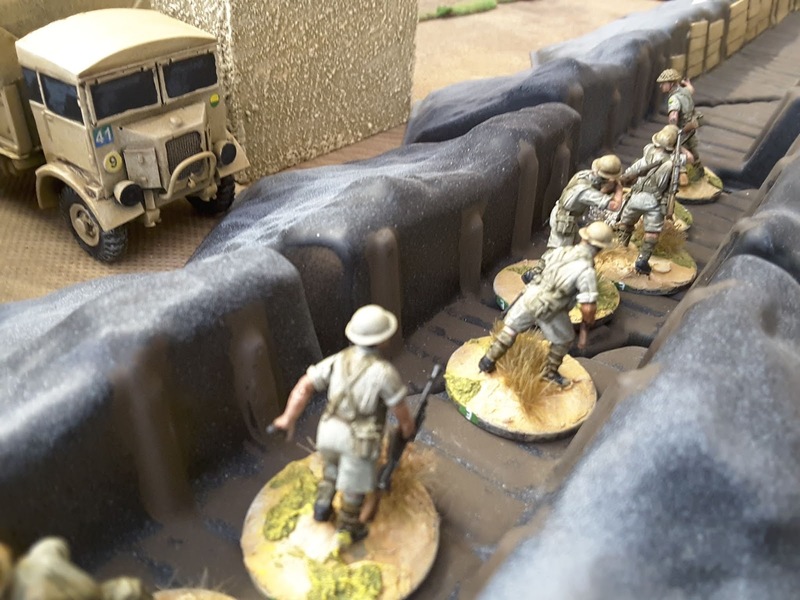 The weather had deteriorated and visibility was poor as British troops raced towards the start line for their attack on Tummar East, Italian Forces drove in the opposite direction to relieve Tummar West, as the weather cleared both sides were surprised by what they saw. 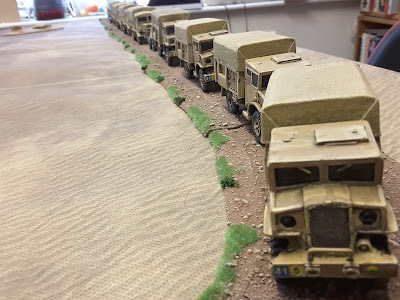 Pass me a Yorkie Bar you big Trucker ! 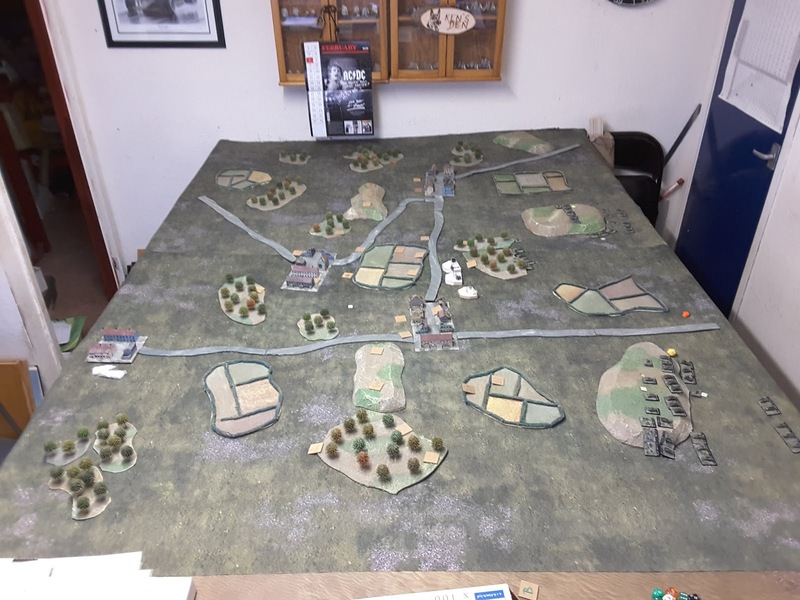 This game was played on a 12 x 6 table which was covered in areas of scrub and low hills, the area to the top right of the photo below represents the ditch around Tummar East with a lone unoccupied watch tower. The following Special Rules are in force (see Resource Page for full details. All vehicles which move off the tracks are subject to a Difficult Going Roll. Sandstorm - there are 3 Sandstorms placed down the long center axis of the table, one in the centre and the other two equidistant to the short table edges. I used some randomly shaped pieces of card about 12 inches round to represent, see Resource Page for full details. 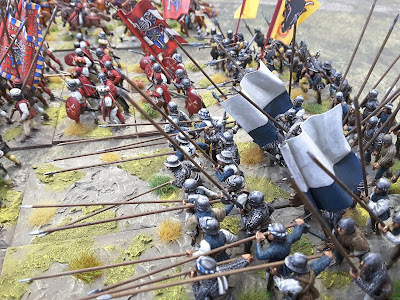 The day is going well and Italian Forts have fallen, it's time to move on to the next. No time to rest. 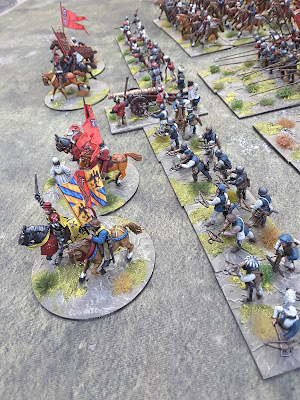 Move your forces off the far end of the table defeating any opposition you meet. 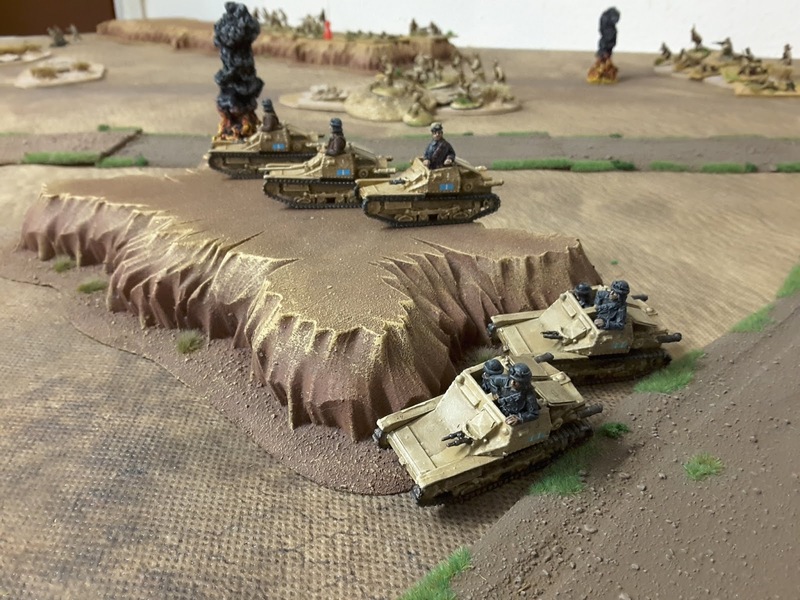 Don't expect reinforcements, this time you are on your own. In the lead of the convoy are 3 Bren Carriers, each contains 3 men who may dismount as either a Boyes AT Team or a Bren LMG team. 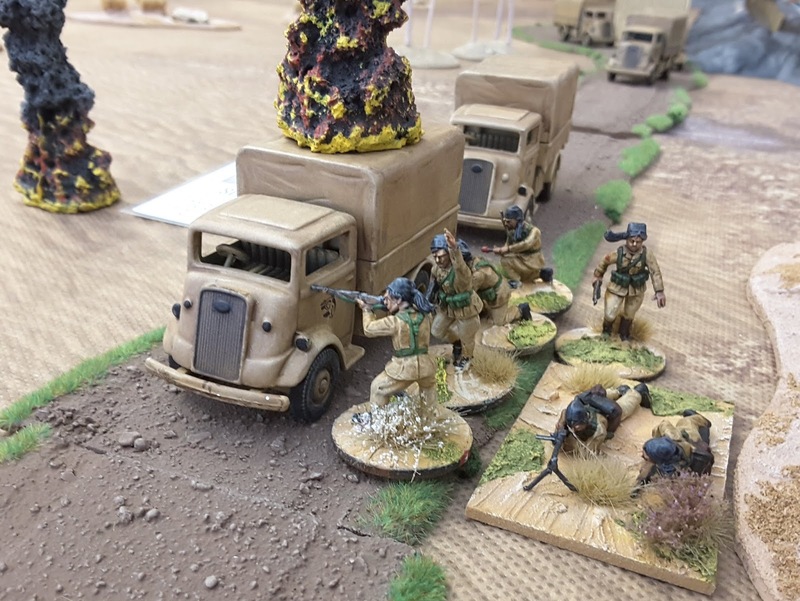 Truck 1 - HQ Section of Officer, Radioman and Sgt, a 2 man 2" Mortar Team and a 2 man Boyes AT Team. Trucks 2,3,4 each with 1 x 10 man squad Sgt with SMG, 2 man Bren Team and 7 Rifles. 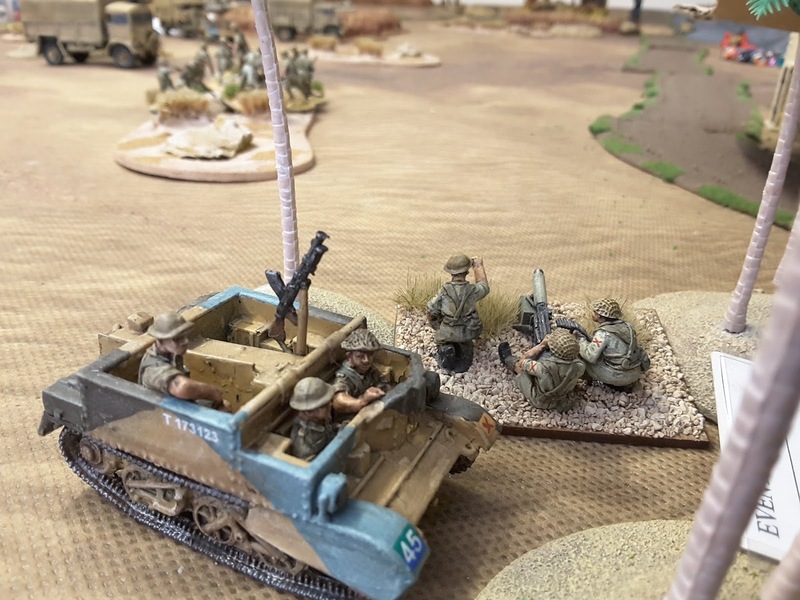 The following 4 trucks are the same with the rear of the column brought up by two Bren Carriers, one with a 3 man HMG Team, the other with a Mortar. The front of the column is halfway down the table opposite the front of the Italian column. 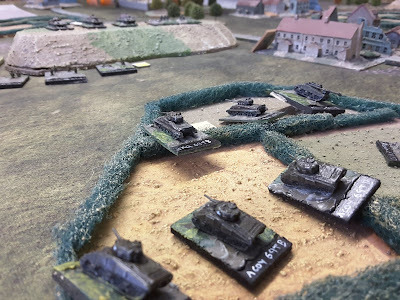 Things haven't been going to well, reports coming in are all about losses and surrender, Tummar East will no doubt be the next target. 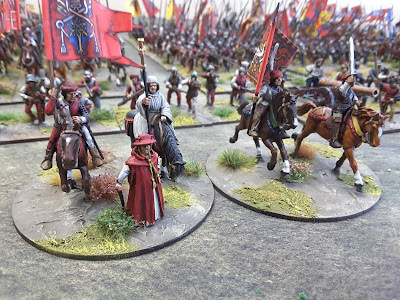 It's time to fight back and get troops in motion towards Tummar West and hold the line there. Get the convoy of trucks off the bottom end of the table as soon as you can, the rest of your troops will arrive on foot. 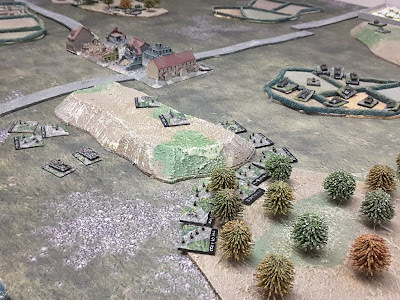 Engage any British troops you find and stop them from exiting the top of the board. The Italian Convoy sets up on the opposite side of the table with the front of the column level with the watch tower and the front of the British. 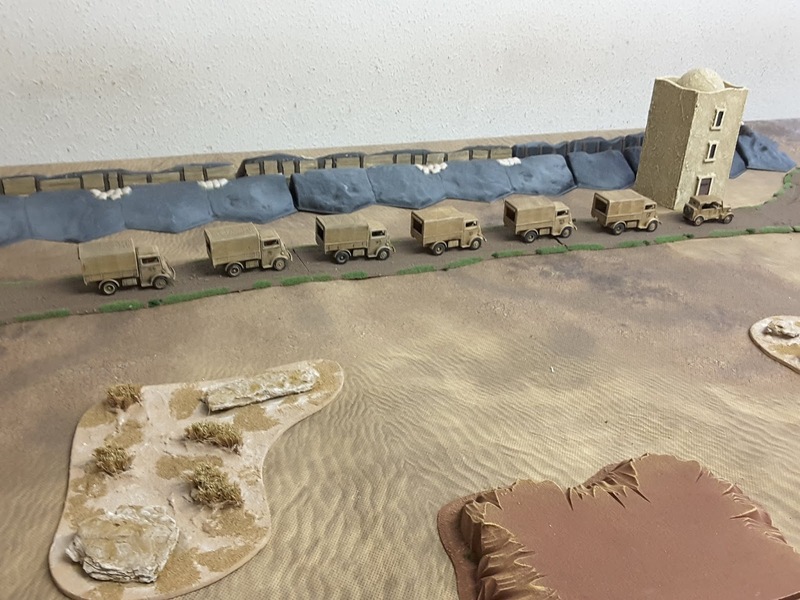 6 x Trucks each with 1 x Italian Squad of 1 Sgt with SMG, 1 LMG with two men and 7 Rifles. The remaining Italian Troops will arrive at random, place an Italian Reinforcements card to the activation deck, each time the card comes out the Italian players will pick one card at random to add to the game deck. 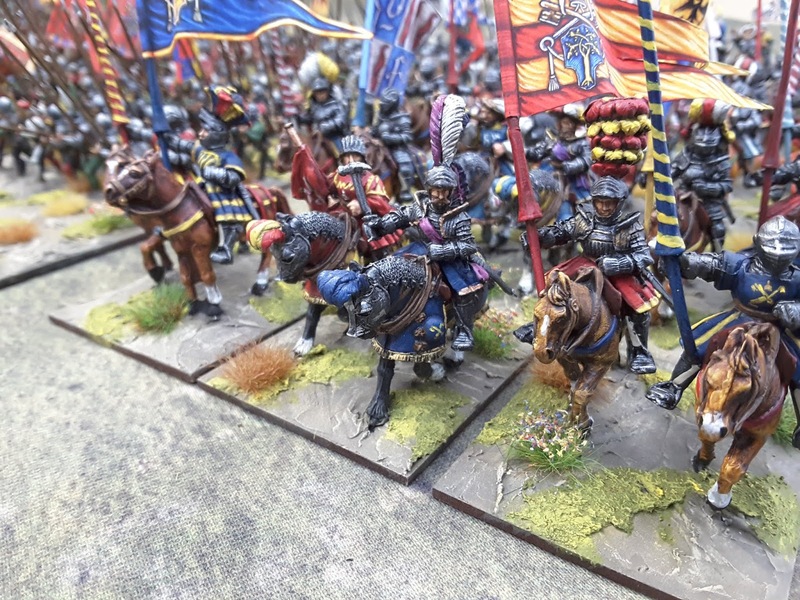 The new unit arriving on the next turn of its card. 1 x 10 man Bersaglieri Motorcycle Squad 1 Sgt with SMG, 2 man LMG team and 7 Rifles. Draw 4 cards at random prior to the start of the game and add to the deck, the remainder added as reinforcements as above. 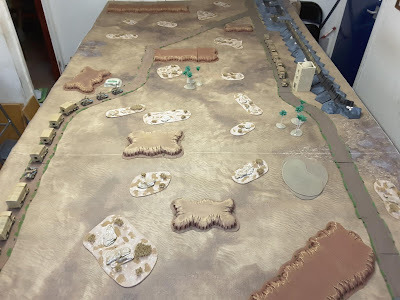 Another great game, what I have really enjoyed about the match ups so far is we are playing with troop types and mixes of troops that we normally wouldn't go near and as a result having fun. Before we started the game I thought this would be an easy win for the Italians, dash the convoy off the table and hold the line with superior numbers preventing the British from exiting the table, Bing bang bosh, easy win for the Italians and onto game 7. 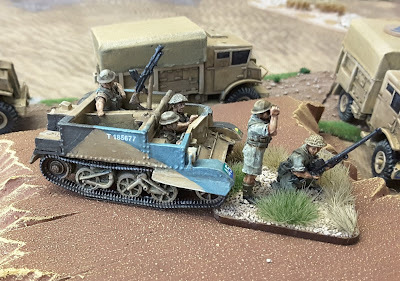 It all went wrong for the Italian Convoy very early on, I had command of the rear of the Allied Column and immediately on spotting the enemy trucks, I debussed my Mortar and Vickers. Hands up I got lucky, I underestimated my Mortar aim point and missed by a good 10 inch, spun the spinny thing and rolled my dice and deviated right on top of one of the trucks. 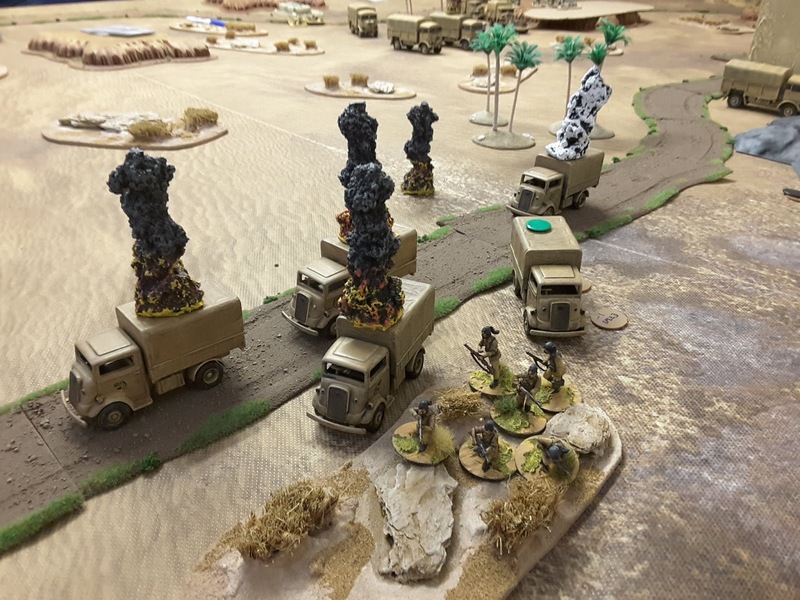 The same turn, the truck in the photo two up was bogged down and easy prey for the Vickers. Meanwhile at the other end of the table the Italians had got all their Tankettes on the table early doors and formed a solid (ish) line on the hills just North of the Watch Tower. 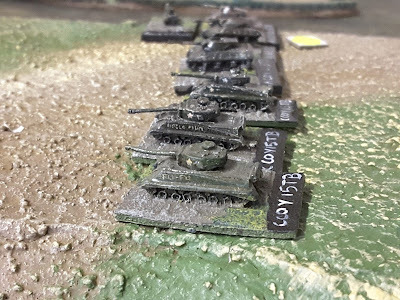 L3s aren't much use but 6 of them with 2 machine guns a piece is a decent amount of firepower. 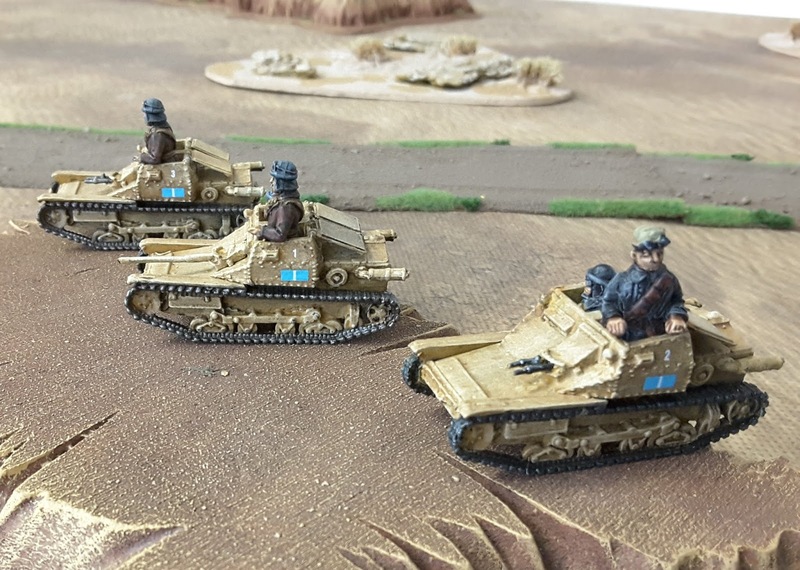 The British Infantry took up a position on the low ridge in front of the Italians, the Bren Carriers selected Boyes AT mode and a big firefight started up. 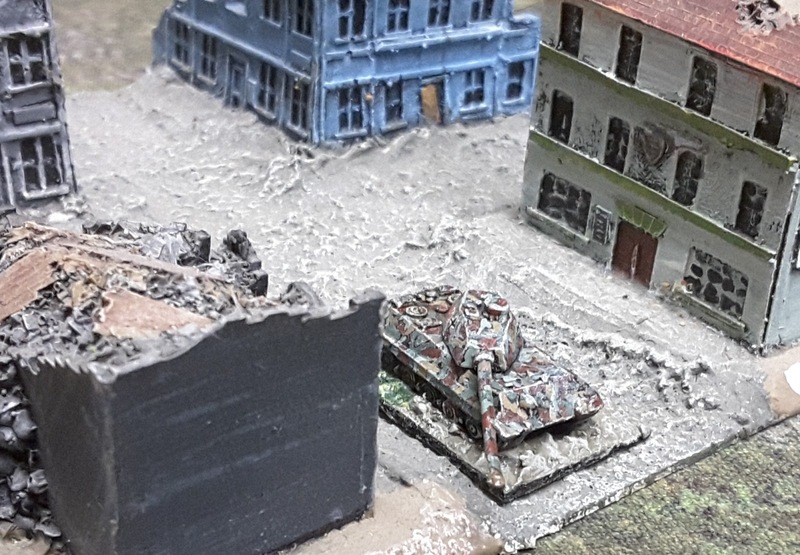 But even with some cover the Boyes teams and the Allied Mortars started to pick the tiny Italian Machines off one by one. 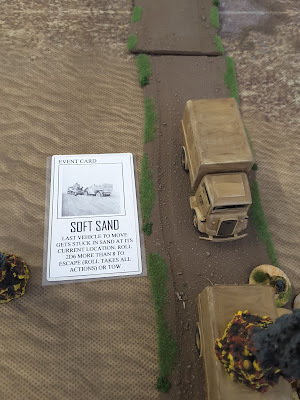 Things hadn't got any better for the Convoy either, turn after turn trucks where taken out by Mortar and HMG fire until the Italians escaped with only a Staff Car and one Truck. 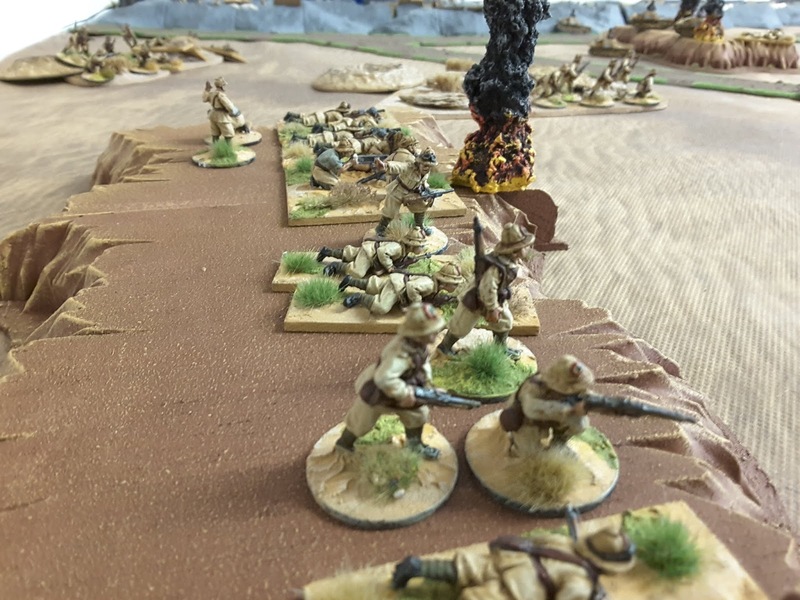 Under the cover of one of the Sandstorms the South African Infantry dashed across the open gap and into the trench and the Watch Tower in an attempt to break the deadlock. 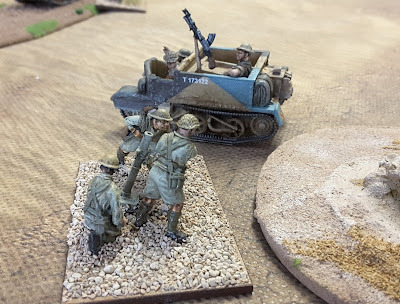 With the convoy destroyed I had the chance to reposition the HMG and pour some more fire on the Italians. 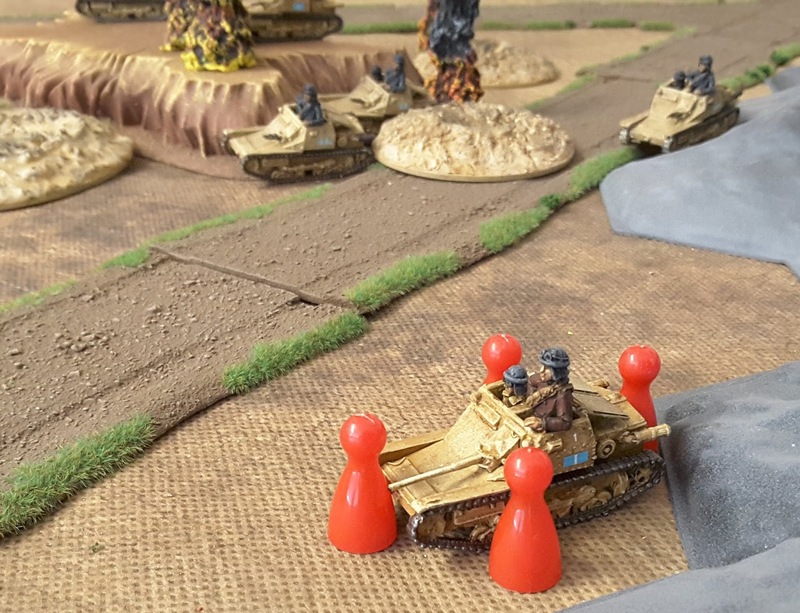 One red meeple equals one morale fail, safe to say this Italian Tank wasnt happy ! 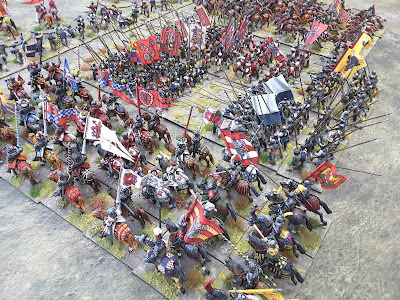 The British and Empire Commander declared that he had insufficient forces to breakout and the game ended in a draw. The Brits had prevented the Italian Convoy leaving the table whilst the Italians had prevented the British from breaking out. So that's 2 points a piece and the British lead in the Campaign 15 to 9. 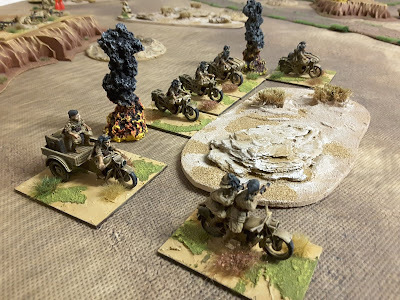 Just remains to say that my brand new Bersaglieri Motorcycle Squad was the last reinforcement card out of the deck and spent a grand total of one turn on the table, on the plus side it didn't take any casualties and avoided the traditional first game drumming. 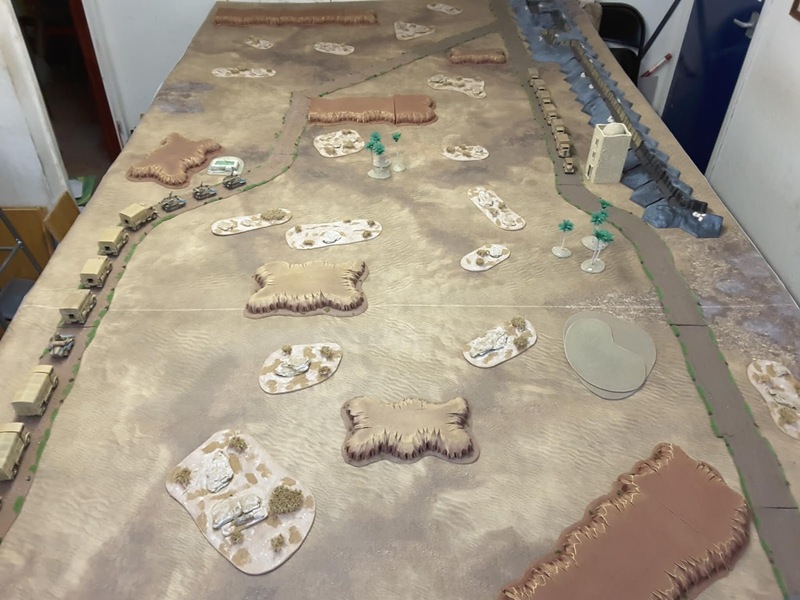 The Op Compass Campaign will take a break for a while whilst we concentrate on our yearly Naval Campaign. See you all soon. The problem with having a lot of figure collections is not being able to use them very often, I try and get round most of the stuff I have at least once a year but my 6mm WW2 has been away too long (April 2016) so it was about time we continued our journey from D-Day to the Assault on the Rhine. 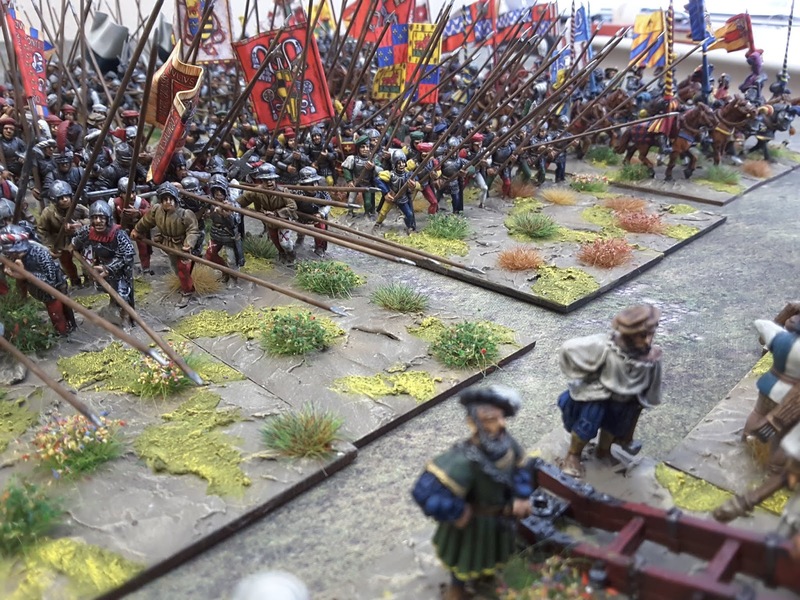 Scale 6mm, Rules Homebrew based on Korp Commander by Bruce Tea Taylor, figure scale approx 1:4. Based on a scenario from the book White Star Rising, scenarios for Spearhead published in 1997. 12th Sept 1944 near Aachen Germany - it's been just three months since the landings and after a slow start it's been a wild ride to get to here but things have been slowing down. 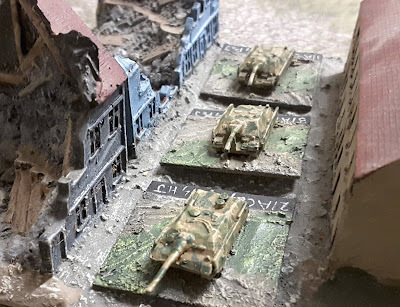 Montgomery in Holland and Patton against the Vosges Mountains. Here in 1st Army sector the going is easier, the plan to punch through the lightly held Siegfried Line and maybe even reach the Rhine, after all the Germans haven't got anything left..... have they ? 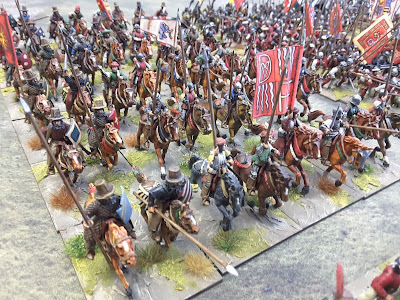 The table is 8ft x 6ft and is shown above, you should be able to see all the main features. 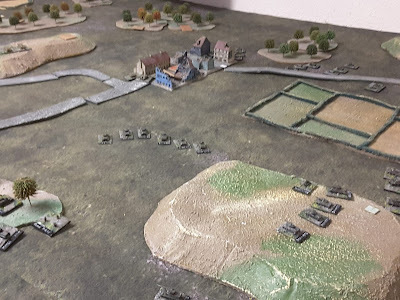 Germans set up hidden anywhere to the left (as viewed) of the line of hill, field, hill, field hill on the far right (apologies for adding humour) of the table. 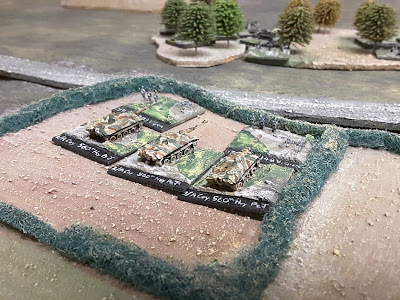 Germans set up on numbered counters with 1 blank counter for each real one. 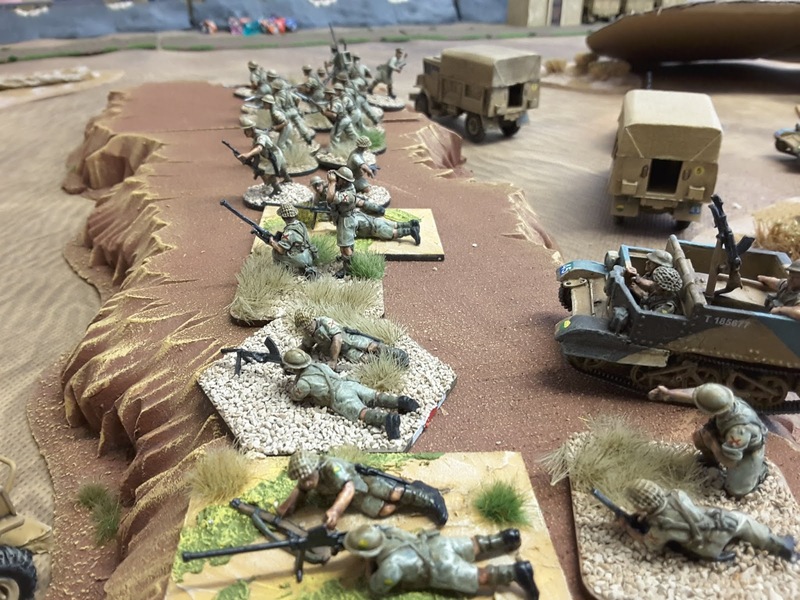 Americans enter the table anywhere along the right table edge. The Westwall runs along the left hand side of the table. The game is decided by a points count up after 15 turns. The game will be decided on points you will receive 5pts per town sector held at the end of the game. 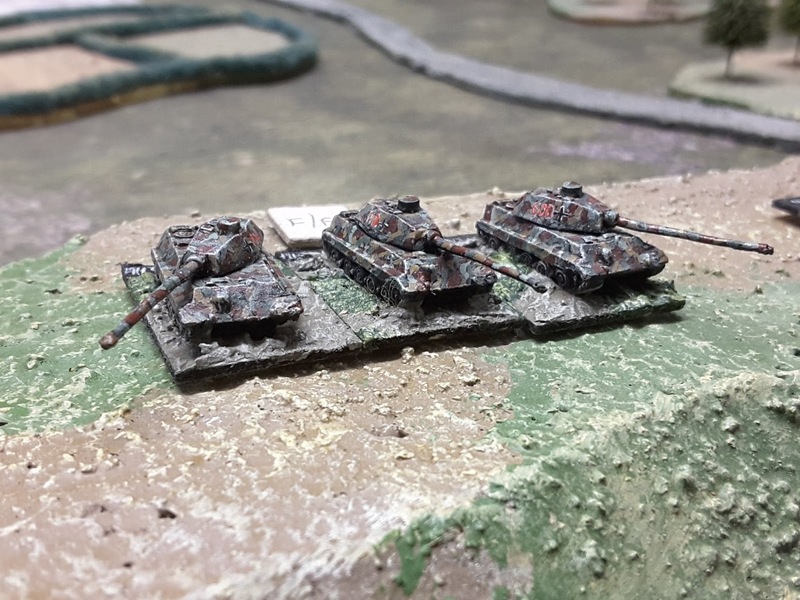 2pts for each AFV destroyed and 5pts for any enemy Battalion routed. Any remaining assets from a standard US Armoured Division at the time so 1 Tank Battalion, 1 Armoured Infantry Battalion, Recce Battalion, Engineer Battalion, Artillery Battalion (2 Companies left) at a rate of 2 Companies per turn anywhere on the US baseline. 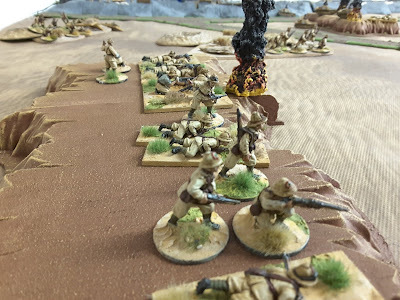 Once a Battalion is committed all of its companies must be activated before another Battalion can be selected. 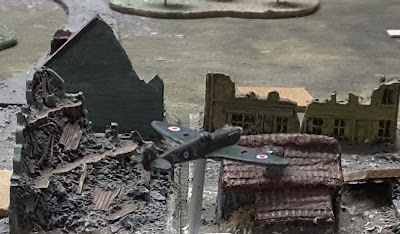 Each player rolls 1d20 and any score over 15 will bring a supporting flight of aircraft. Roll a second dice on any success with a 50% chance of receiving a flight of rocket armed Typhoons if not a flight of CAP arrives over the table, they will remain over the table for 6 turns and may perform 1 gun attack on a ground target as they leave. 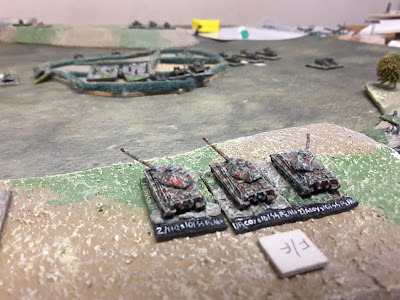 The German player scores 2 points for each enemy Rifle Platoon Killed, 1 point for each Tank Platoon Killed, 10 points for each enemy Battalion routed. 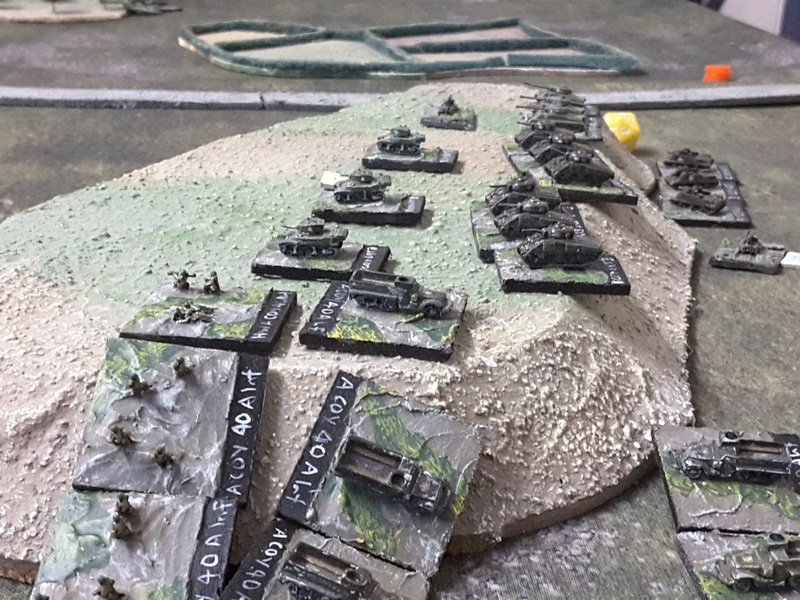 Set up as described above, there is no off table artillery, all German players will receive 1 roll of a d20 per turn with the Luftwaffe turning up on a 20. 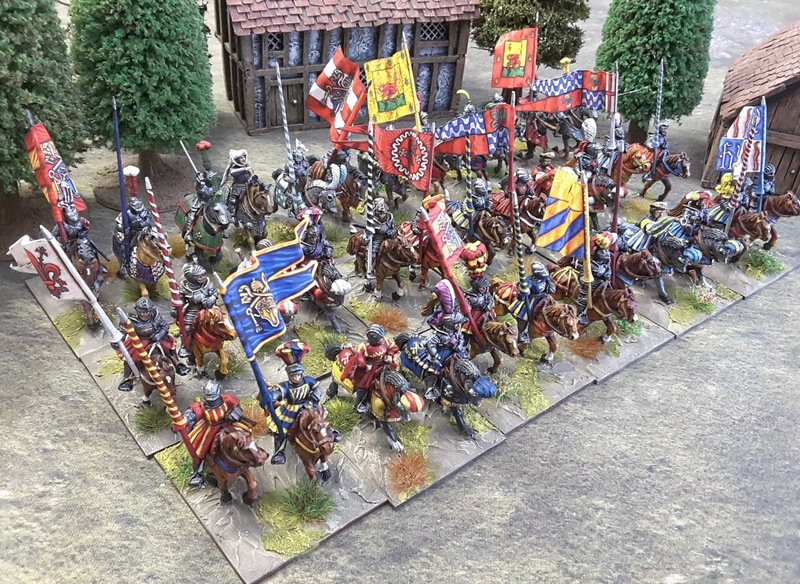 Roll for type as American. This is quite an interesting game with the Germans having all the Gucci toys but the Americans having all the resources. 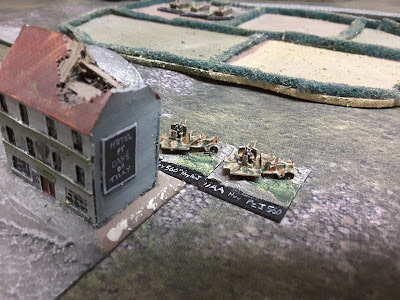 The Germans set their main line of defence down the centre of the table from the large wood in the foreground of the set up shot across the villages using the Armoured resources to form killing grounds in front of the terrain whilst the Infantry waited in Ambush in the cover. The American Players, uncertain of the location began their attack with two main lines of attack. One against the hill nearest the camera on the set up shot, commanded by myself. 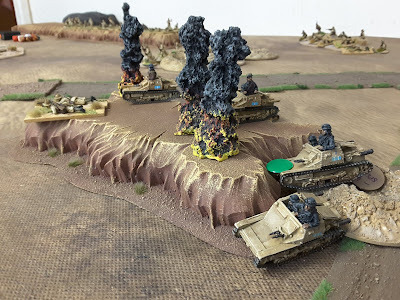 My plan was to push forward in the centre with my tanks whilst rushing my APC borne Infantry round the wood to flank the hill, leaving my M36 Tank Destroyers on the hill behind on Overwatch. Let's call this the Left Column. 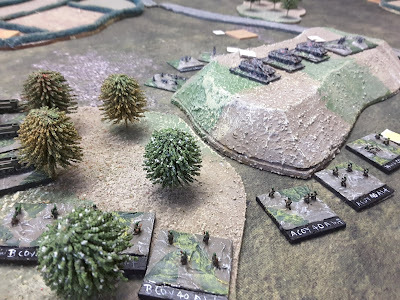 The second column pushed forward around the hill and woods in the centre of the American lines, the Infantry heading for the wood, the Tanks for the two section village. I will call this the Right Column. 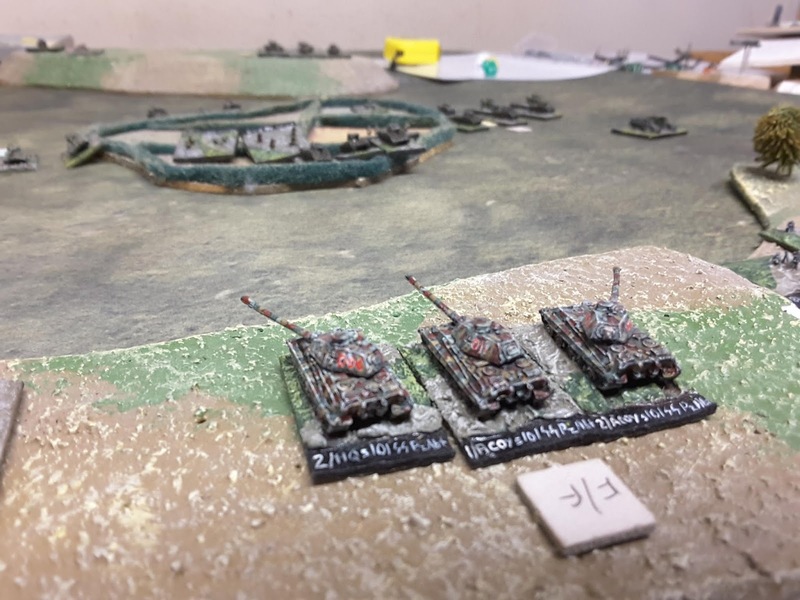 Both columns came under heavy fire as soon as they broke cover, the Left by a Company of Tiger II, the Left by some Jagdpanthers on a hill and the JpzIV in the village. Casualties were as expected quite heavy, especially on the right where the Americans were caught in the open as shown in the above. 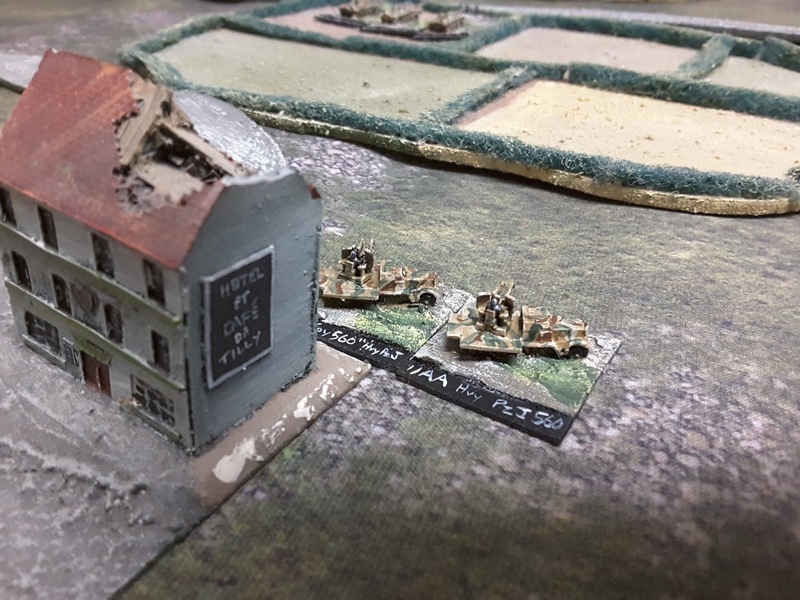 However the main German Armour had been located, it just needed the Air Force to turn up. The problem was it didn't turn up enough and when it did it was CAP and not Ground Attack ! But that's the dice for you. The Luftwaffe wisely didn't turn up at all, it wouldn't have got anywhere anyway as there was around 20 Spitfires over the table waiting for something to chew up. 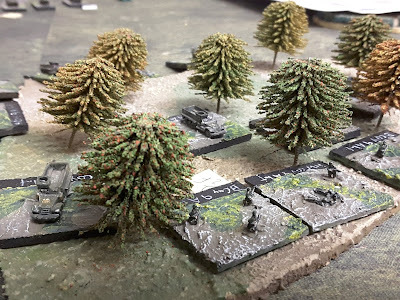 The American Infantry on the left got into the woods in strength driving out the Volks Grenadiers who had been holding out in there, this allowed them to start turning the flank of the Tigers. On the other side of the table the Americans had brought on their ACAV battalion and scores of Jeeps Greyhounds and M5s started to pour down the right flank. 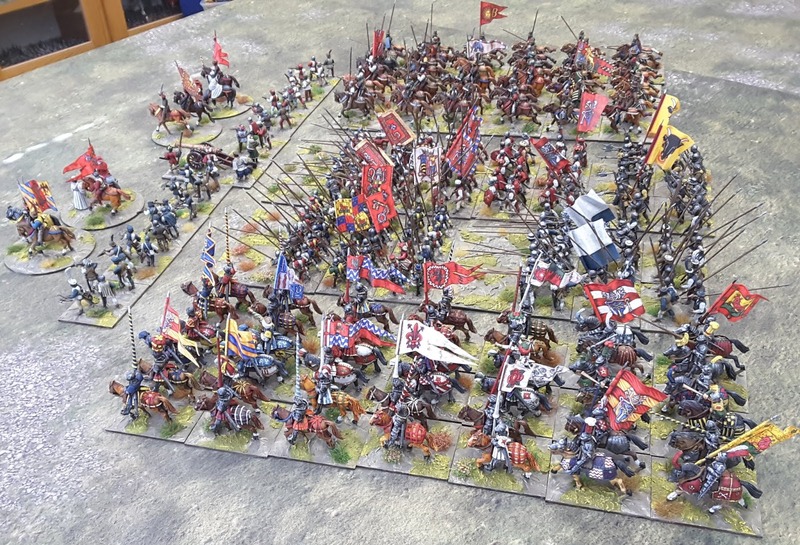 The game ended after a couple of our evening sessions and all that was left to do was add up the points. 24 points to the Americans for 12 AFV kills. 17 points to the Germans for 15 Tank Platoon losses and 1 Infantry loss. A good scenario, the Germans get to shoot loads of stuff but the Americans have the upper edge in numbers. 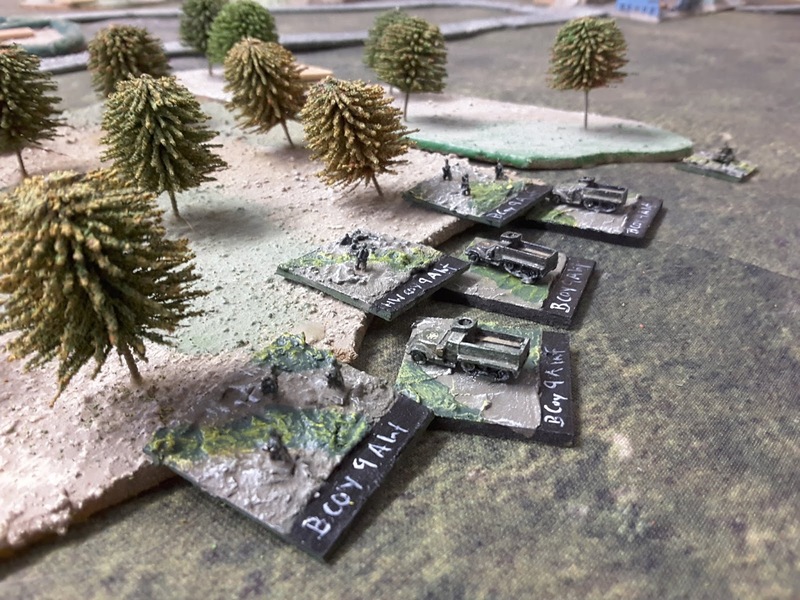 Next up in our WW2 6mm games will be a Market Garden game whilst on the table we have the next instalment of our Op Compass Campaign. A very quick post today just to say how chuffed I am that my recent Italian Wars Project won the Challengers' Choice Award in the Analogue Hobbies Winter Paint Challenge XI. 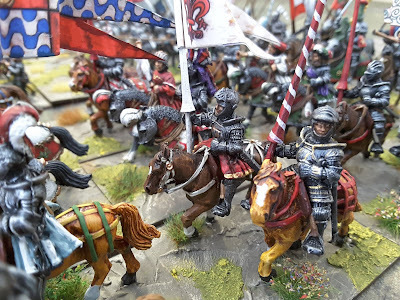 For those who don't know the AHPC is run each year and brings together a group of painters and gamers who paint off against each other during the winter months scoring points for figures painted and based during that time. Various prizes are avaliable from the Challenge sponsors. 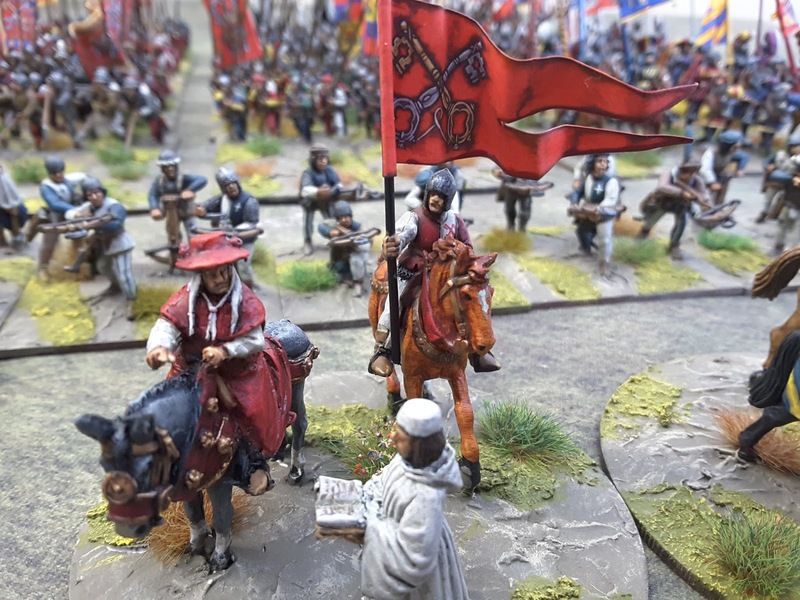 The Challengers Choice Award is voted for by the participants of the AHPC so that makes winning it even more special and it looks like the Italian Wars Project got over 50% of the voters, which is amazing. 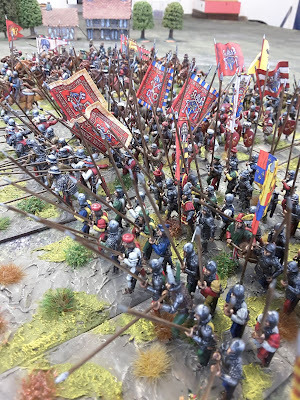 In this occasional series of posts on Yarkshire Gamer I have been looking back at some of the collections I have built up over the years, in contrast this post is more looking forward with this my latest project. 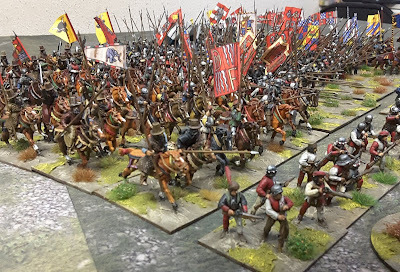 Regular readers will have seen this army build up fairly rapidly over the last few months, helped by both the Analogue Hobbies Winter Paint Challenge and an unplanned period of 6 weeks off work. It's by no means complete but this will be the bulk of the army going forward. Focus will switch to other projects but I have plans to add the odd unit here and there and let's face it an Army is never really finished. If you prefer Moving Pictures (not the Rush album ! 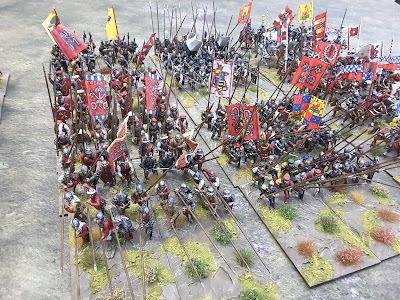 although that is awesome) Yarkshire TV have spent millions, ok a cup of Tea and a Tunnocks Wafer in producing this Cecil B de Mille like historical epic, enjoy. For those of you scared of moving pictures I have added some still photos to the post, above is the vanguard showing two units of shot, a gun and 4 Command Bases. 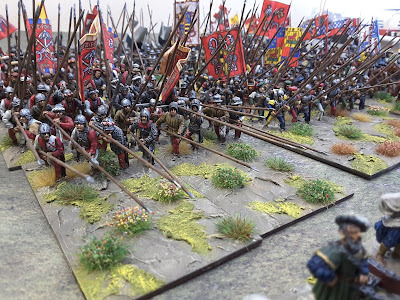 The one thing that impresses me the most with this army are these command stands, I am normally useless when it comes to these and end up with massive armies with no command bases, I am always borrowing SYW commanders when playing Napoleonic games and vice versa, not with this army, by Jove no. The first 5 ranks of Condottieri are Foundry, the rear 2 Perrys, although it added to the cost I am glad I went for 2 flags per 6 figures it gives the units a great look. 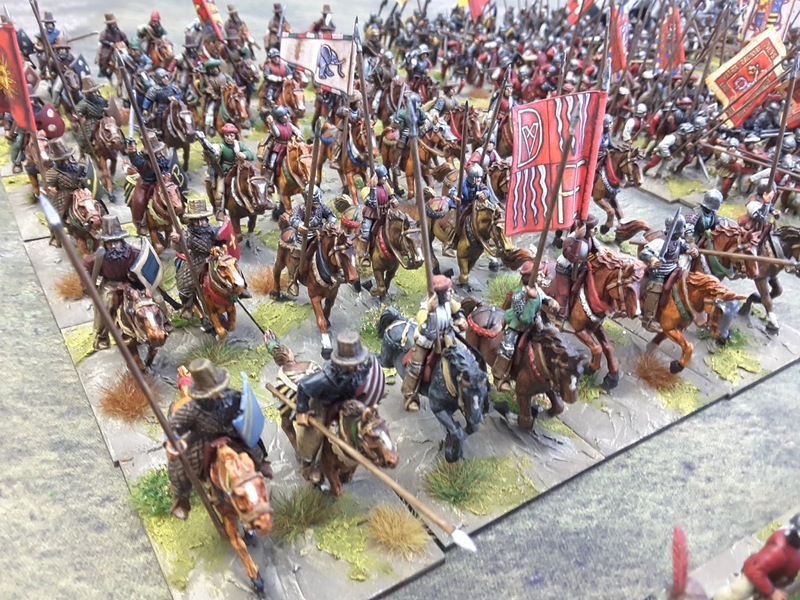 The other flank of the Parade is full of my light Cavalry, Stradiots with bow and others with Lance, Mounted Crossbow and some Light lance armed troops to, all Perrys, a mix of metal and plastic. I got a bit carried away on the mounted troops for the army but somewhere in the middle of all that horse flesh are three Pike Blocks, a Sword and Shield unit and a Polearm unit. I love the way the pikes look en masse. Nearest the camera is a block from TAG figures the rest are Perrys again a mix of metals and plastic. 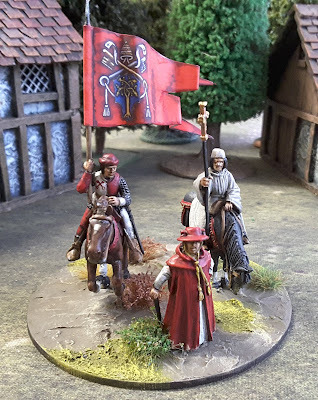 My personal favourite unit is the red and white liveried Papal Pike Block, the colours, figures and flags just seem to work really well together. So there we have a little journey around the latest addition to the Yarkshire Gamer stable, hope you enjoyed. 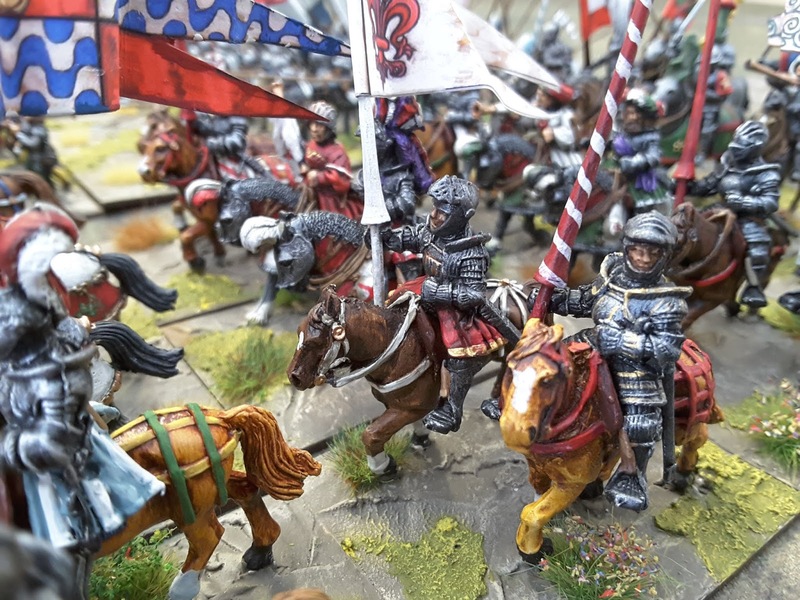 Italian Wars Project : "Light Cavalry"
All content is property of the author, unless stated, please ask permission to reproduce.. Simple theme. Powered by Blogger.